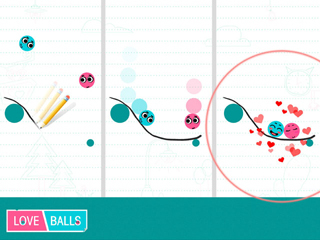 Love Balls - Download and Play Free on iOS and Android! Is there anything sadder than two faraway lovers? If there is, I don't want to hear about it. With that in mind, Love Balls could very well be the single most depressing app to ever appear on a phone, but don't break the hankies out just yet. With a little brain power and a few well-drawn lines, you just might be able to bring those little star-crossed lovebirds together after all! So much stands in the way of these lonely little orbs, but don't lose heart! The red string of destiny can never be denied. You just need to give it a little push or two to get it going. Draw lines and shapes to control the fall of every onscreen object. Create inclines, walls, ramps, hooks, swings and platforms to bring the lovers together. Complete hundreds of unique puzzles. Beware of falling blocks, bottomless pits and no-draw zones, or learn to use them to your advantage! Draw as efficiently as you can to get the highest score. If you like playing puzzle games, then you're in for a real treat here because this one will give your brain the workout it so desperately craves. It will challenge your problem-solving abilities like nothing before and in ways you never thought possible. If you're up for the task, then give this app a go right now. It will be like meeting the loves of your life all over again. If you're looking for romance, you typically won't have a hard time finding it. It's been the basis of countless books, movies and TV shows, and all too many people are obsessed with it to the point where it can honestly get sickening. However, there is one place where romance has remained conspicuously absent: the mobile game. That is a fact that makes Love Balls a very strange little app. On the plus side, it is a very fun and creative one as well, and could very well be considered one of the greats if the people at SuperTapx weren't so greedy. Romance is almost literally the name of the game here. It stars two dots, a blue one we'll refer to as Brian and a pink one we'll call Penny, who have intense feelings for one another. Unfortunately, they're kept separated by circumstances, the landscape and the fact that they don't have any limbs to walk around with. That's where you come in. You need to get the two love-starved little circles together, but the only thing that actually makes them move is gravity, and they're never going to be positioned in a way that will allow them to fall together. What do you do? You add to the environment by drawing things on it. Every line you trace on your screen can affect the world as if it were a solid object. You can draw lines to serve as barriers, platforms or bridges to redirect where things fall, you can draw more elaborate shapes like triangles to serve as ramps, and you can even just make a curve to give a certain lonely dot a small push forward. Like the best puzzle games out there, the act of drawing your solution is a deceptively simple mechanic that's easy to grasp, but which lends itself to surprisingly complex gameplay. Brian and Penny are situated a great number of ways in an even greater number of environments, and getting them together in the app's many levels requires you to draw all sorts of odd lines and shapes that aren't always obvious, but are always logical. Things only get more complicated the further on you go too. 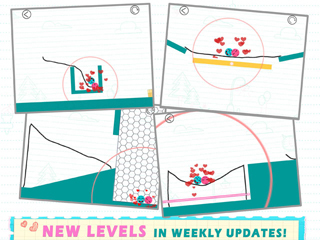 The game adds things like meshed zones where you can't draw anything, falling objects that prove a further hindrance to your star-crossed lovers, and other things that force you to change things up. What makes the app especially fun is just how open-ended its puzzles really are. While there is always a best solution that will get you the highest score possible, it's not the only one, and you're free to come up with your own. You can either draw one line at the beginning that will cause everything to fall in place, or you can draw several lines once everything starts dropping for a more fast-paced and reactionary form of puzzle-solving. It's loads of fun. Unfortunately, there is something to this game that isn't fun at all, and that is the way it tries to monetize itself. This app is absolutely crawling with ads. A banner is always pasted on the bottom of the screen, waiting for you to accidentally tap it so that you can be muscled out of your game and into some web page you want nothing to do with. If you want to get a hint for particularly tough puzzle, you have to watch an ad first to get it. Other times, the game will just throw a commercial in your face without your prompting, and hold the app hostage until you watch it. That last one is very annoying. You're forced to watch a new ad every five rounds or so of play, including failed rounds you had to restart. Considering a round in this app can last for as little as three seconds, and the gameplay is very prone to trial-and-error, these commercials pop up with very annoying frequency. You can skip most of them after a few seconds go by, but the fact that you'll likely see them again within a minute hardly makes that a point worth celebrating. You can bypass the ads by purchasing the app, but it's questionable if it's really worth the $3.99 it's asking for. It's not like there aren't a whole lot of other mobile games out there competing for your time, and a lot of them have higher production values than this one. To its credit, the soundtrack is admittedly nice and relaxing, but it certainly isn't worth spending $3.99 on alone. There is a lot to like about this app, thanks to the unique gameplay that allows for a multitude of creative solutions. Unfortunately, the sheer greed it displays does much to drag it down. Ads may be a necessary evil for most free-to-play mobile games, but this one takes things too far. If you find yourself loving the game that much, then maybe it'll be for the best to just buy it and avoid the hassle. Otherwise, it's recommended you hold off until something better comes along.